Photo: Walters Art Museum via Creative Commons. Tim William Machan, editor of Imagining Medieval English - Language Structures and Theories 500-1500 (2016) explores the significance of the phrase 'language and literature'. Many medievalists would describe themselves as working in language and literature. Many even work in departments of language and literature, whether English, French, Norse, or other traditions. But where the emphasis in the phrase falls – on the language or on the literature – can differ a great deal from one scholar to another. In the old days, in the days of Tolkien and Lewis, it was language that received primary emphasis. Through philology, a work’s date and provenance could be determined, along with the resolution of all kinds of individual textual cruces. And with that information in mind, critics could, if they desired, talk about a work’s meaning, though they didn’t need to. From the New Criticism through Deconstruction and the New Historicism, the emphasis has shifted to literature. These schools of thought read from different perspectives and for different reasons, to be sure, and they all rely on language, but they ask less about syntax or lexis and more about rhetoric and cultural work. Both approaches – the old duo of “lang and lit” – continue today, though they often operate independently of one another. Endnotes and bibliographies can be very telling in this regard. Articles about linguistic change in the post-Conquest period rarely share works cited with those about post-Conquest cultural practice. Just as articles about the Lollards’ use of English rarely contain references that overlap with those on the grammatical characteristics of Central Midland Standard and its relations to other late-medieval varieties of English. As much as this kind of critical separation can further knowledge about particular issues, literary or linguistic, both sides lose something when they operate independently of one another. The whole notion of what English meant and of what cultural work it performed after the Conquest, for example, is enriched by discussions of how and when language periods are drawn. The distinction between Old and Middle English, indeed, is less a given than an argument. 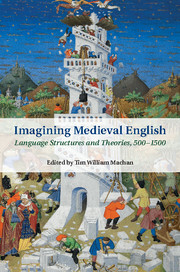 This is the background for the collection of essays Imagining Medieval English: Language Structures and Theories, 500-1500. Bringing together notable literary critics, linguists, and individuals who are all at once lang and lit, the anthology crosses a critical divide, even as it addresses questions of importance to all scholars of the English Middle Ages. How did medieval speakers conceptualize English and its relations to the other languages used in medieval England? How have critical frameworks shaped the nature of the surviving record? How well do modern views of language and its impact on cultural practice match up with medieval views? What other ways might medieval English, in its variations and history, be imagined? With topics as diverse as conversational Middle English, everyday Old English syntax, and the nature of literary language in medieval England, Imagining Medieval English unearths new information about many specific cultural practices in medieval England. As importantly, its takes a critical position that is at once lang and lit, one that puts language forms and cultural practice in dialogue with one another.